Mechanical washing machines appeared in the early 1800s, although they were all hand-powered. Early models cleaned clothes by rubbing them, while later models cleaned clothes by moving them through water. Steam-powered commercial washers appeared in the 1850s, but home washing machines remained entirely hand-powered until the early 1900s, when several companies started making electric machines. The Automatic Electric Washer Company and Hurley Machine Corporation both began selling electric washers in 1907, while Maytag offered an electric wringer washer in 1911. In 1947, Bendix offered the first fully automatic washing machine, and by 1953 spin-dry machines overtook the wringer types in popularity. The last wringer washer manufactured in the United States was made in June of 1990 at Speed Queen's plant in Ripon, Wisconsin. The major U.S. manufacturers today are General Electric, Maytag (Montgomery Ward), Speed Queen (Amana and Montgomery Ward), Whirlpool (Kenmore), and White Consolidated (Frigidaire and Westinghouse). The washing machine operates by a motor, which is connected to the agitator through a unit called a transmission. The motor and transmission are near the bottom of the machine, while the agitator extends up through the middle of the machine. The transmission is similar to the transmission in your automobile in that it changes the speed and direction of the agitator. In one direction (agitate), the transmission changes the rotation of the agitator and spin tub—the inside tub with small holes in it—into a back-and-forth motion. When the motor is reversed by the controls (spin), the transmission locks up and the agitator, transmission, and spin tub all rotate as a unit. Without the transmission changing the speed or direction, the unit uses centrifugal force to remove as much water from the clothes as possible. The motor is also connected to a pump. When the motor is moving in the spin direction, the pump removes the water from the tub and discards it through the drain pipe. Most sheet metal parts, including the body, are formed by a machine that presses a piece of sheet metal between two halves of a mold (die). Because metal in parts shaped by only one die tends to wrinkle, crack, or tear, multiple dies are generally used to form each component. The tub sub-assembly is manufactured automatically. After being rolled into a drum shape, the side is welded. The weld is then smoothed out and the drum is placed on an expander, which stretches the tub into its final shape. A bottom is then welded onto the drum, and this weld is also smoothed. isn't visible unless you open the machine cabinet, enameling iron with a porcelain coating is generally used. Whirlpool is the exception, using plastic instead of enameling iron for the outer wash tub. Many other parts are plastic as well. Manufacturers receive raw plastic from which they fabricate parts in pieces about the size of a small ant, using them for machine components that do not bear weight and/or require extremely good rust resistance. Such parts include the pump, the tub guards (which prevent your clothes from being thrown out of the spin tub into the wash tub or the cabinet area), and the agitator. The transmission is generally made from cast aluminum, which arrives from the manufacturer in ingots—20 pound slabs of aluminum. Scrap parts are usually remelted and reused. Hoses, controls (timers, switches, etc. ), and motors are purchased in prefabricated form from other manufacturers. 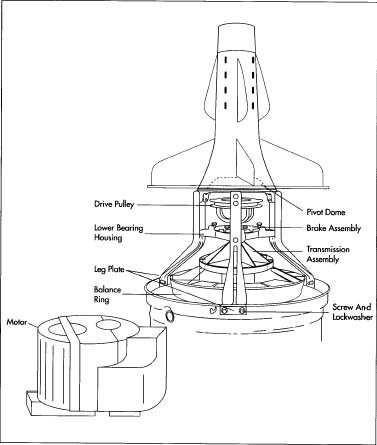 Most of the key components—transmission, motor, broke assembly—are housed below the agitator. The balance ring is a weighted ring that keeps the washer from moving around during operation. molten metal is mechanically ladled into the mold and cooled. The ensuing rough casting is then given its final shape by various machines which drill holes, shave excess metal off critical surfaces, or cut metal away from the part. 6 The tub parts are made in presses, and the sub-assembly is manufactured automatically. After being rolled into a drum shape, the side is welded. The weld is then smoothed out and the drum is placed on a unit called an expander, which stretches the tub into its final shape. A bottom is then welded onto the drum, and this weld is also smoothed. If the tub is stainless steel it is polished so it won't snag the clothes. Otherwise the tub is dipped in a solution called a ground coat and heated to about 1600 degrees until this coating hardens. If the tub will not be visible (the wash tub), the unit is done. If the tub will be visible (the spin tub), a finish coat is applied following the same procedure used with the ground coat; this final coat gives the tub either a white or blue color. 7 The balance ring is a large weight that stabilizes the washer. Its outside structure is plastic, with a ring of metal melted into the plastic for strength. Cement is added and balanced precisely. This ring, which weighs more than twenty pounds, keeps the machine from "walking," or moving about, when it is in use. 10 Using a hydraulically operated mechanism, workers then lift this assembly, called the module, onto the washer base. Springs are added to hold module and base together. A seal is added, the spin tub is bolted to the transmission inside of the wash tub, and its plastic covers are snapped into place. A plastic hub, which attaches the agitator to the transmission, is bolted onto the output end of the transmission shaft. Then the agitator is snapped onto the hub. 11 The pump and a mounting bracket are now bolted onto the motor, which is then fitted with a shield to protect against potential leaks. This assembly is bolted to the base of the washing machine and connected to the transmission module with a belt and hoses. 12 Next, the lid hinges are attached to the lid and the top. The top of the washer is bolted to the cabinet with a hinge for easy maintenance. A mixing valve to control the mixture of hot and cold is bolted to the back of the cabinet. The graphics panel, which provides words and pictures to explain the controls, is mounted on the control panel; the controls themselves are attached from the back. The wiring, connected as one unit, is called a harness. The harness is clipped to the control connectors at one end, and the other end is passed through a hole in the top to be mounted to the motor. Because of its large size and weight, the cabinet assembly is then placed in the washer by a robot. 13 The cabinet is bolted to the base, and the controls are snapped together with the mating connectors on the module and motor. The drain hose is pulled through the cabinet and a part called the gooseneck is added. This part is what gives the hose its hook shape so that it will fasten into the drain. After being tested, the front panel is bolted on, and a packet of information and accessories is added. 14 The finished unit is crated automatically. A machine opens the cardboard box, which was flat for shipment, and drops it over the washer. The top and bottom flaps are simultaneously folded over and glued. Then the machine applies pressure on the top and bottom of the crate to make sure the glue sets properly. After the glue has set, the machine puts a banding strap around the top of the crate to add strength for lift truck transportation (the units are carried from the top to reduce the risk of damage). All parts purchased from outside manufacturers are spot checked before use, and most sub-assemblies are checked as well. For instance, all transmissions are automatically tested for operation, noise, and vibration. All pumps are leak-tested using air, automatically if their assembly was automated and manually if it was manual. All painted parts are visually inspected for defects. Daily samples are put in detergent, bleach, and steam baths for corrosion testing. Once it has been completely assembled, the machine is filled with water and tested for noise, vibration, and visual defects, as well as properly functional controls and mechanisms. After packaging, some units are put through severe tests to simulate the transportation conditions to test the cartoning process. 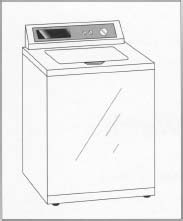 Although at present most home washing machines in the United States are top-loading, these will likely be gradually displaced by front-load washers. Because they require less water, front-load washers satisfy government restrictions on water use. Also, in Japan a washer is being tested that cleans with bubbles rather than with an agitator. Using a computer, this machine "senses" how soiled each load of clothing is and then generates the bubble acfivity necessary to remove that amount of dirt. 20,000 cycles per second, cannot be distinguished by the human ear. "To Be Fuzzy, or Not To Be Fuzzy." Appliance Manufacturer. February, 1993, pp. 31-32. "Whirlpool Goes Off on a World Tour." Business Week. June 3, 1991, pp. 98-100. 'The Future Looks 'Fuzzy."' Newsweek, May 28,1990, pp. 46-47. Stafanides, E. J. 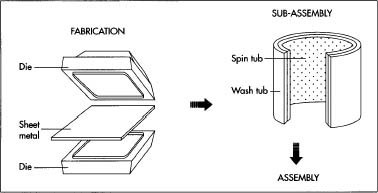 "Frictional Damping Smooths Automatic Washer Spin Cycles," Design News. February 15, 1988.